Veerababu(Allari Naresh) is a small-time tailor who gets his best friend Suri Babu(Sunil) married to a local dancer(Nandini) just to impress his MLA(Jayaprakash Reddy). This is also the time when Posani and his gang find out that the MLA has all the details about a sum of 500 crores. Rest of the story is as to how Suri Babu, Veerababu and the entire gang gets entangled in this septup and grab the money at last. 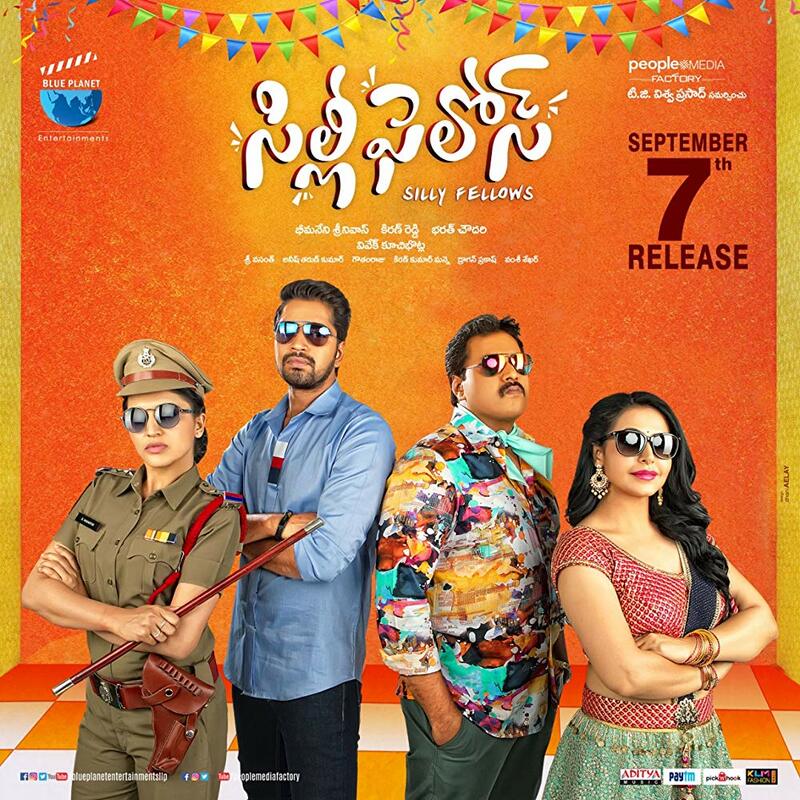 Silly Fellows (2018) Veerababu(Allari Naresh) is a small-time tailor who gets his best friend Suri Babu(Sunil) married to a local dancer(Nandini) just to impress his MLA(Jayaprakash Reddy). This is also the time when Posani and his gang find out that the MLA has all the details about a sum of 500 crores. Rest of the story is as to how Suri Babu, Veerababu and the entire gang gets entangled in this septup and grab the money at last..
SUNIL & ALLARI NARESH ,are acting together in one frame like freinds ,audience waiting for these combination set to laugh full movie time with there actions ,now silly fellows are in theaters ,allari naresh was a tailor and sunil was lazy boy and sunil was married ,in between jai prakash narayana was mla and he was transcation huge amount and both them involve ,y they and what happend to final is the movie watch on big screen . silly fellows now in theaters from morning show onwards audience are shown interest to watch these two comedy heros on one frame ,story is nice and every frame was so laughble ,so director gives little emotion means it will works and help to movie its miss ,other wise its a full entertainer movie .allari naresh and sunil acts there best in roles other cast and crew also good screen play is good to watch .so go and watch on big screen silly fellows . SILLY FELOWS ,a comedy combo basket is coming on big screen to entertained us ,srinivas bheemineni directed and written this story ,music was sri vasanth gives his best ,recently movie team started promotions and teasers are trending in youtube .over all its an comedy entertainer so wait and watch on big screen . director srinivas bhemineni ,written this silly fellows .alla nresh and sunil these two comedy heros join thogther first time .story is simply a comedy of two friends there life .so these two want a huge hit now beacause past movies are dissapointed ver well .lets see on big screen how SILLY FELLOWS are entertained . SILLY FELLOWS a correct tittle of these two guys ,sunil and allri naresh combination is over joy for comedy lovers .director bhimaneni srinivas making this script in fun zoner and very good way .already teasers and trailers of this movie trending superbly .on this week end enjoy with ur family these silly fellows are coming on big screens. The Movie Succeeds Generating Comedy. Though It’s A Tamil Remake Did Not Fail To Create Telugu Comedy. It..
Jayaprakash Reddy Recollecting His Memory And Telling The Same Story From Early Morning Is One Of The.. In Totality, Silly Fellows Is A Regular Comedy Caper That Lacks Entertainment Quotient. Both Allari Naresh..
All In All, The Film Is Neither Out Rightly Decent Comedy Nor Can Be Called Completely Rubbish. Pretty..
A Copycat Remake, 'Silly Fellows' Falls Flat With Its Uneventful Story, Loud Comedy And Too Much Of Reliance.. The Runtime Is Crisp. Every Scene Succeeds In Generating Comedy And Will Make The Audience Laugh. There Are..
Silly Fellows Is What You Should Not Even Watch When You Are Extremely Silly And Free. Silly Fellows Is..
On The Whole, Silly Fellows Is Bit Better Film Than Allari Naresh And Sunil’s Previous Duds. There Is..
Silly Fellows Movie Success Meet..
Silly Fellow Movie Team Exclusive..
Silly Fellows Movie First Look..